The whole world is watching the financial events unfolding in the island nation of Greece. After years of socialist-style governing, Athens finally crumbled and is now on the brink of total ruin. If the country changes moving forward, however, it could become a prosperous nation in the next 20 to 30 years. But what about the United States and its enormous debt levels? The Land of the Free is $18 trillion in the red and faces $120 trillion worth of unfunded entitlements and expenditures. In fact, its debt as a percentage of the gross domestic product is expected to reach Greek levels within 20 years. Today, Greece’s debt-to-GDP is 175 percent, while America’s is between 80 and 100 percent. 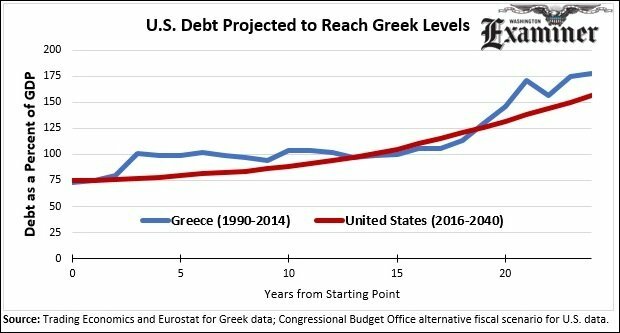 The U.S. is projected to reach Greece’s level by 2035, or even before. That is if nothing gets done. And knowing U.S. politicians, whether it’s Hillary Clinton or Jeb Bush, nothing will get done and the nation’s finances will be deferred to another generation. Meanwhile, the federal government will just print, borrow and tax more to pay for more wars, welfare and big government.